Inauguración de la temporada de futbol | ¡VidaMaz! Danny has played soccer since he was about four years old. We’ve been through the routine: practice, practice, practice. Hand out the uniforms. Receive a season schedule, as well as a sign-up sheet for parents to bring oranges and drinks to one of the games. Take the group photo. Pay for the photos, and forget to send the photos you’ve purchased to friends and relatives, so that you save a whole pile of years of soccer photos in the drawer, untouched. Attend the games and yell and scream and have a terrific time with the other parents. Play in a tournament or two, and maybe win a trophy or medal. 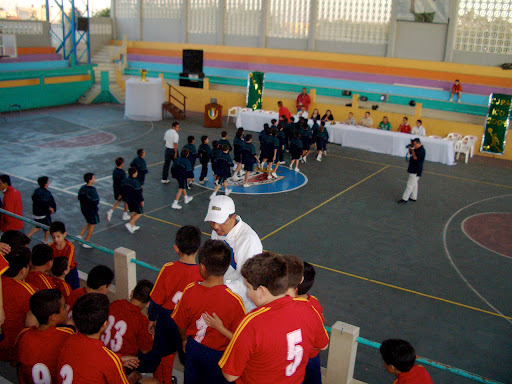 No ceremony for the winners; the medal or trophy is handed out whenever, after the close of the tournament. Have a swim party at a parent or coach’s house to celebrate the end of the spring season. So, this is our first year in Mazatlán. Danny’s now in junior high. He was psyched to be able to make the school futbol team; he was worried his American skills wouldn’t be good enough down here, where kids have grown up playing street soccer every day. They do have great ball handling, but Danny’s fast, and a sound defender. He’s gratefully on the team. Last week Wednesday we are told that he needs to be at ICO, the major school in town, tomorrow at 4:30. No other info. Forget that we might have other plans; everything here is always last minute (like hearing on Friday night that the first game of the tournament will be Saturday morning at 8 am, or hearing Tuesday night that Wednesday there won’t be school. People here aren’t big on planning and prior notice). 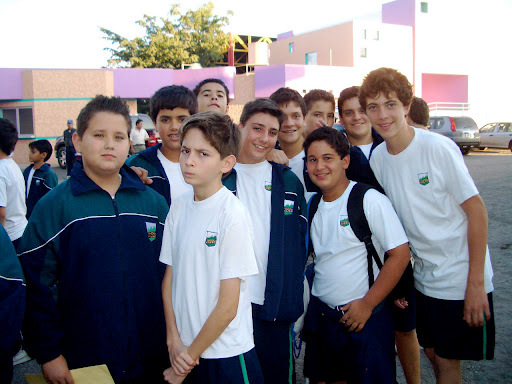 On Thursday at school Danny’s told to bring 20 pesos, a copy of his birth certificate and school ID, and his PE uniform to ICO that afternoon. We arrive at ICO. No parking places, as it appears every car in Mazatlán is at this school. Obviously this is not a simple gathering but something major. 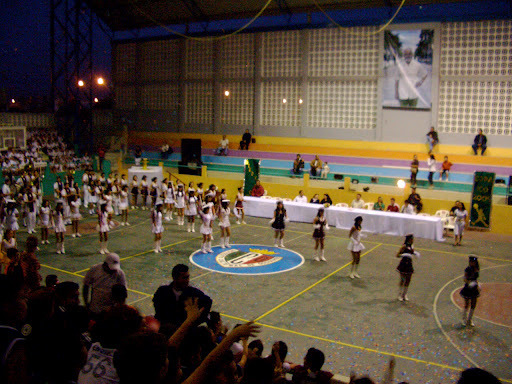 We enter ICO for the first time; these Franciscans have some money—it is a huge school with new and well-maintained buildings, a central promenade of palm trees, and numerous gymnasiums, courts and stadiums. They are obviously sports nuts. The facilities are unbelievable and envy-producing. The crowd (hundreds of people, if not a thousand–a huge crowd) is walking down the palm-lined promenade to the other end of the school, which feels about three blocks away. 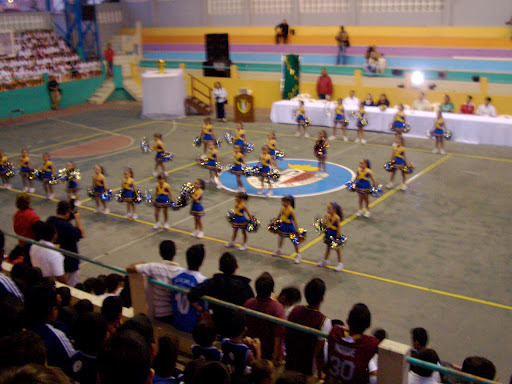 There is a large outdoor covered auditorium, encircled by cement bleachers. We find Danny’s team and wait. We are surrounded by other teams, coaches, parents, cheerleaders, bands, you name it. It is definitely noisy and crowded. It’s a party. Everything here is; any excuse for a party. We love it. An hour after the appointed time, about 5:30, we file into the auditorium. The kids go under the bleachers. Apparently there is a very large room down there, because there have got to be about 30 or more teams that gather down there. Along with the cheerleaders, pom pom girls, flag girls, drum majors, and bands. Ok, this seems like it’s going to be a big ceremony. We are now told it’s the “inauguration of soccer season,” the ICO Cup Tournament. There is a head table. A few speeches are given. ICO is exhalted as a wonderful school about 11 times. Come on already. It’s nice of you to sponsor the tournament, but enough horn-tooting and advertising for the school. A band plays. There is dancing. 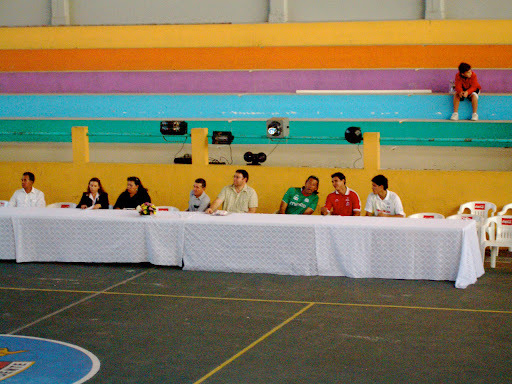 The teams are announced, and school by school they parade out into the auditorium, circle the main floor, and are seated. Much fanfare. You’d think you were at the Olympics. Another band plays. There is smoke and a light show. Fire jugglers entertain us. Several dance routines by scantily clad young women and primary school girls. Confetti is dropped from the rafters. 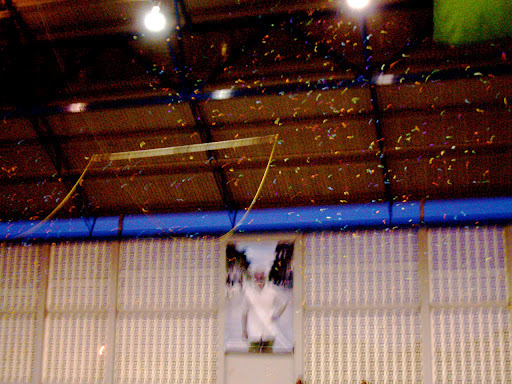 Kids cheerfully jump to catch the confetti, amidst another laser light show and dance routine. Just like the start of the recreational soccer season at home. Ha! Not even pro soccer in the US gets this much fanfare. And I only have my little camera. I say about ten times how I wish I’d brought the good camera. Who would have known? We see our friend Bob Gallagher, and Maria Anderson. They both knew it would be the inauguration, but neither of them told us. We didn’t know they’d be here, so we didn’t know to ask them. Oh well, such is life in a new place. Then, what we’ve evidently all been waiting for: the lighting of the torch. Two men, this year’s tournament heads, are handed a lit torch by last year’s tournament leader. The torch seems to be burning out of control. The two men don’t really want to hold it–it looks dangerous. One of them takes the torch, but seems to want to slam it to the cement floor and stomp on it to put out the fire. 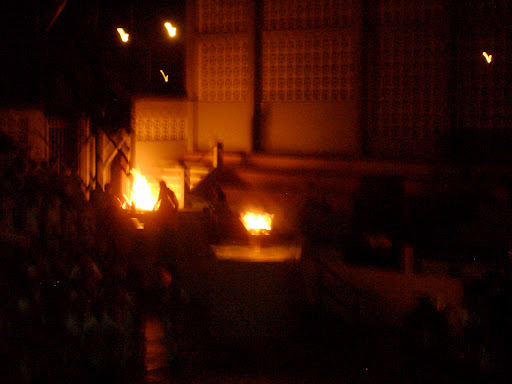 But, no, he’s urged to climb the steps, towards the fire pot, to light the large Olympic-style fire container. The man obviously is very uncomfortable. The torch is nearly burning his hand and arm off. He hurries. He lights the main fire container. While everyone cheers and applauds, the out-of-control torch is hurled to the ground and several men try to jump on it to put the fire out. But, burning liquid pours out from the torch, and we now have a fire show: a three-meter-long firefall behind the main Olympic fire. Cool, but obviously unintended. Definitely dangerous. Thank God for concrete buildings! It’s now about 7:30 pm. We’ve been at ICO three hours. We’ve heard five or six bands, seen about 12 dance routines. We’ve had laser light shows and confetti drops, as well as the intended and unintended fire shows. Everyone’s itching to get home; enough’s enough. Parents start to stand up, walk over and get their kids to take them home. Father Ian, the head of ICO, grabs the microphone to ask people, in fluent Spanish, to please stay just 15 minutes more. No one listens. There is chaos as parents push through the crowd, weaving amidst the marching band and dancing flag girls with no care as to how long these poor kids have prepared for this night. They get their kids and jam the aisles and the performance arena as they attempt to leave. Thank goodness the auditorium is not on fire, as no one is able to get out quickly. Miraculously no one is injured, no ambulances called. By 8:00, the auditorium is empty, the cacophony had died down. A terrific inaugural, for sure. 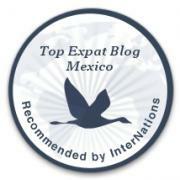 A delicious slice of the cultural life of Mazatlán. Dianne, I love your blog! 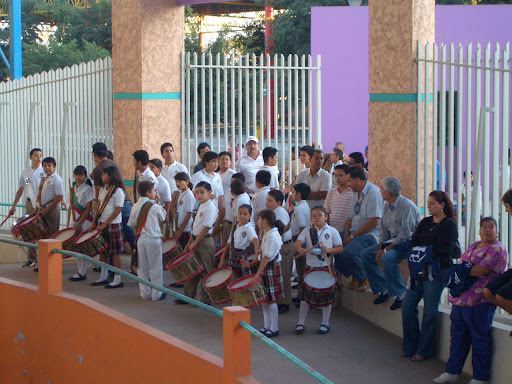 You really express the crazy-wonderful-strange-interesting world of Mazatlan well.This post about the ceremony is so funny and triggered something for me when I often don´t know what to expect or what is going on. I really like your blog and the fact that you have a little one in school only brings back memories from when I went to school there. 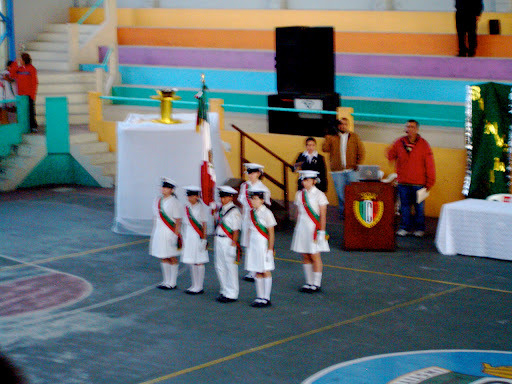 I went to Liceo in 6th grade and had already registered to attend the ICO when we moved back to the US. I was sad, so sad to leave all the new and wonderful friends I had made (which most attended el ICO) and all my lovely extended family. The wondeful thin is that with the beauty of today's technology and Facebook, I still keep in touch with my old friends.Thank you for bringing back some sweet memories.So is your son going to attend EL ICO? Lisa, we're in the middle of our second school year here now. Danny's at Andes, not ICO. He has quite a few friends over at ICO, but he prefers the much smaller class size and community at Andes.Sounds like your parents gave you a truly wonderful adventure! Bless you for staying in touch with friends and for treasuring that terrific experience!